A. White furniture is gorgeous! It is becoming ever more popular because of its ability to meld with most all home styles. It brightens a room and gives it a clean, inviting feel. B. SLIPCOVERS! Slipcovers are where its at! Seriously. Think for a moment about all the little (or big) messes that have happened on your furniture. In my household alone there has been coffee, red wine, chocolate, mud, blood, lipstick and a nasty pee/poo combo from a diaper explosion. Oh and my puppy decided to pee on the couch the other day (see photo below). You scrub at your furniture or maybe use an attachment on a shampooer, but how do you know for sure you got that nasty stuff completely out of your furniture? Well you can’t. Not unless you have removable slipcovers!! C. Slipcovered furniture is so easy to clean. Yes, easy! All those nasty stains mentioned above come right out and my furniture looks bright white and brand new after every wash! Here is my tutorial detailing the simple steps and basic products I use to get my furniture bright and clean every time! I prefer to wash my slipcovers no more than once a month. The only exceptions being for particularly bad messes or when i’m hosting a gathering. The beauty of separate slipcovers for your cushions is that you can wash only what you need to. You may wash yours more or less based on your family’s habits, but I find once every 4-6 weeks to be the sweet spot for me. The supplies you need are quite basic. Those last two are in bold because they are my secret weapons for bright, white furniture! 1. Spot clean stains whenever they happen. It will make the slipcovers easier to launder whenever the time comes. 2. When it’s time to wash, use your stain pre-treat. 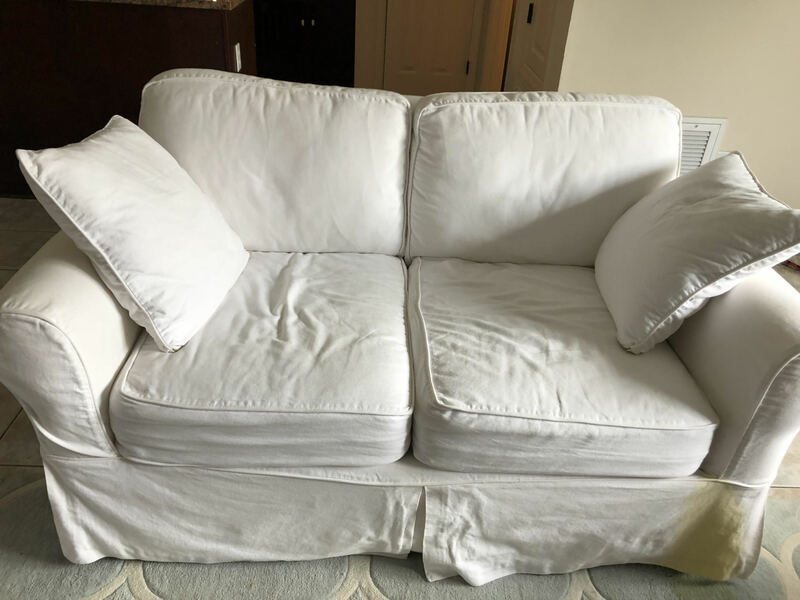 I take off the cushioned slipcovers to pre-treat, but find it easier to treat the large slipcovers while they are still on the couch. 3. 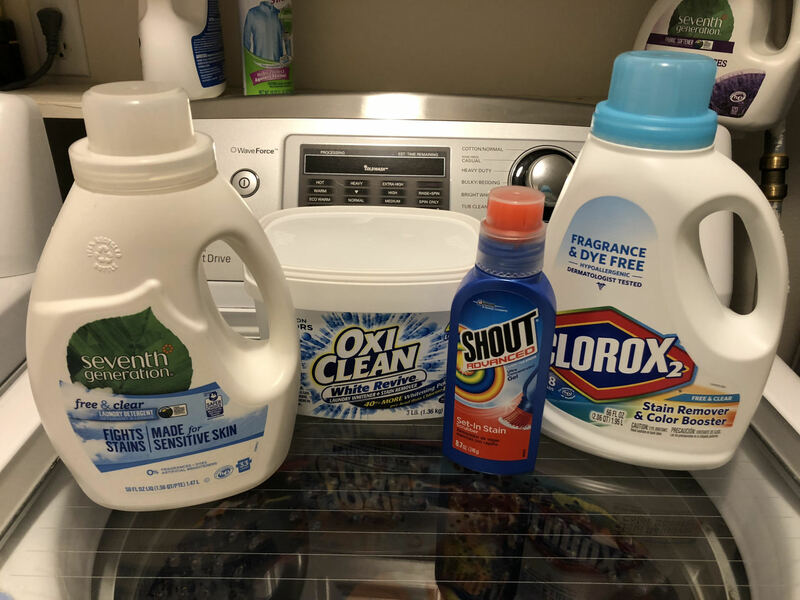 Toss them in the wash with your detergent, Clorox 2 and Oxi Clean. I run mine with warm water on the bulky/bedding setting and always do a pre-soak! That soak/wash cycle takes about an hour and a half. 4. Tumble dry on low heat. 5. I find it best to remove the slipcovers while they are still just slightly damp. This makes them easier to mold over the furniture and allows any wrinkles to fall flat. If you forget and leave them in the dryer, don’t worry, any wrinkles steam out easily. That’s it! Seriously easy peasy and peace of mind that you have completely clean furniture! If you have any questions about the process, just comment below or click the Contact Me link at the top of the page!